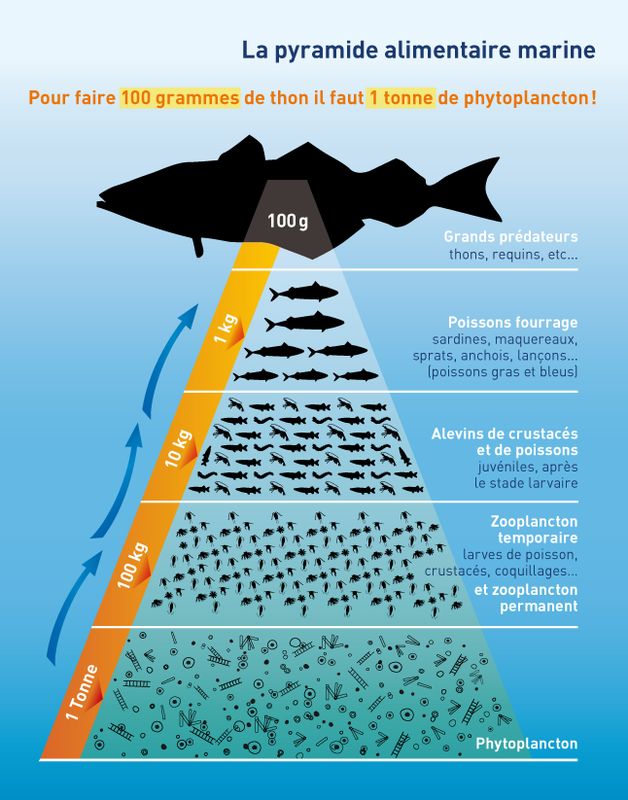 un océan de PLASTIQUE - L'océan nourrit les poissons et les coquillages ! Saving the ocean, what does that have to do with us? How can we take action to save the ocean? Marine animals cannot tell the difference between their food (krill, plankton or jellyfish for example) and the plastic in the ocean. When swallowed, microplastic releases chemical substances that poison the animal’s body, and larger pieces of plastic block their stomachs and kill them. When we eat fish or shellfish, we eat more or less what they have eaten, so we are faced with the same pollutants. The problem is that we are exposed, repeatedly, to chemical pollution that we cannot detect: it does not alter the taste or the consistency of what we eat. In the English Channel, 36.5% of fish contain plastic (20). In the USA, 25% of fish are affected (19), and in the Mediterranean, more than 18% (21). Plastic has been found in 83% of Norwegian lobsters (22). In Europe, the average shellfish consumer ingests 11,000 pieces of microplastic per year (23). The food chain, how does it work? 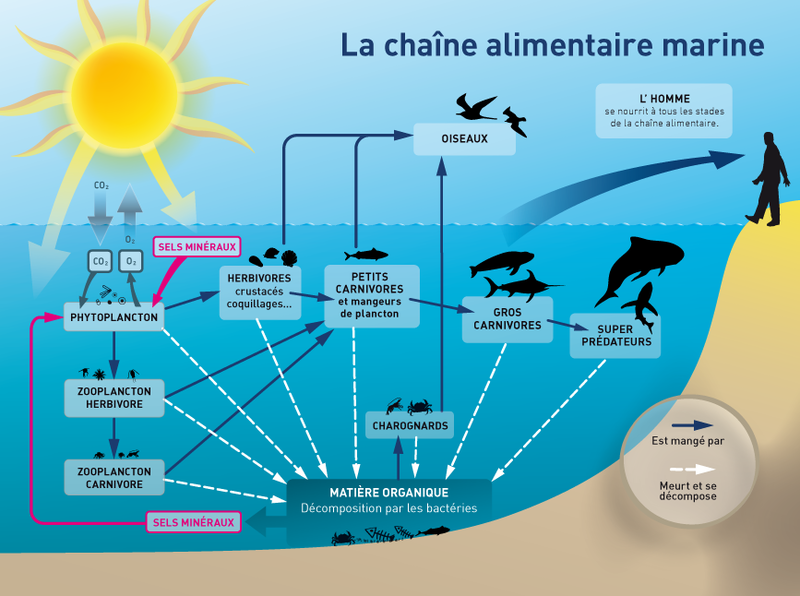 These two excellent diagrams courtesy of the Plancton du Monde website website show clearly how the food chain works. One thing to remember: what small creatures eat eventually ends up inside bigger creatures, including humans. Marine animals do not distinguish between their food and the small pieces of plastic found in the ocean. The plastic they ingest obstructs their stomach, which is often enough to kill them because they cannot digest it: 99% of seabirds have plastic in their stomach (24). Plastic kills 1 million of them each year and more than 100,000 marine mammals (25). But plastic also has a slower and more insidious effect: it poisons. Indeed, on top of its own chemical composition, microplastic stores the persistent organic pollutants that are found in the ocean, creating truly toxic little pills. So the plastic eaten by marine animals eventually ends up on humans’ plates, at the other end of the food chain. Find out more How do we take action? Got a comment, remark, idea or project? Let’s talk about it! un océan de PLASTIQUE is a non-scientific information website that sets out the main issues with plastic in the ocean.